ISR-affiliated Professor Emeritus Ben Shneiderman (CS/UMIACS) will participate in a special program at Arena Stage at the Mead Center for American Theater, Molly Smith Study, Washington, DC, on Sunday Aug.12, from 5:30 to 7:30 p.m. The Arena Civil Dialogues series provides an opportunity for people in the D.C. metro area to engage in civil discourse about social and political issues, demonstrating that people of diverse viewpoints can have fruitful dialogues with each other. The conversations discuss topics related to current events. While the Dialogue Starters will begin the conversation, most of the time will be dedicated to discussion from the participants. • Will robots take more of our jobs? • Will robots outsmart people? • Can robots start wars? Joining Shneiderman as Dialogue Starters are Jared Bernstein from the Center on Budget and Policy Priorities; Molly Kinder of New America, Mary Wareham of Human Rights Watch and Roman Yampolskly from the University of Louisville. Shneiderman writes, “As you’ll guess, I think automation is largely a positive force, which increases productivity, lowers costs, and raises living standards. Automation expands the demand for services, thereby raising employment, which is what has happened at Amazon and Fedex. “Yes, automation is disruptive, but human creative capabilities will create more new jobs, as it has during the agricultural, industrial, technology, and medical revolutions. Gutenberg’s printing press reduced employment for scribes, but the explosion of publication, readers, and writers brought many benefits. Similarly, weaving looms expanded the market and employment in the textile industry, while bank machines increased services and employment in banking. Increasing automation in medical care contributes to better healthcare and expanded employment. Overall, increasing levels of automation are correlated with lower costs, which lead to expanded demand and improved services, thereby increasing employment. 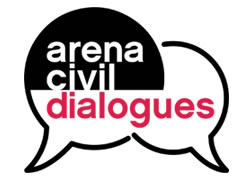 Arena Civil Dialogues are free events that are prone to filling quickly. If you would like to attend, it is easy to register here on the Arena Stage website.